The above quotation comes from a research conducted on skills education for adult Tibetan immigrants in the United States. At the time of research in 2012, it was unclear why many participants (Tibetan professionals in the United States) were less willing, committed and interested in supporting his or her own group of Tibetan peoples when it comes to providing direct services such as educational programs and volunteering. After more than a year of working directly with the Tibetan community in New York, the writer seems to have gathered sufficient evidences to support the research finding on the perceived negative attitude of Tibetan professional towards his or her own group of peoples. These evidences are shared through three personal experiences below. To add context to what this article intends to communicate, my current job allows to work on a federal grant that helps refugees and asylees. For more on this grant, check the picture on the right. 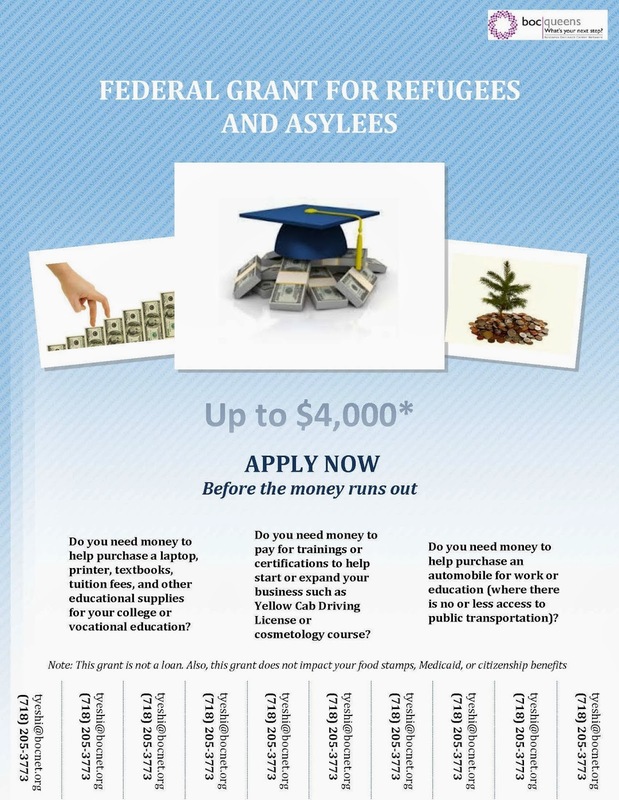 This is a federal grant for all refugees and asylees in New York and neighboring states. The first and most recent experience kicked in a couple of days ago. At the request of an eligible Tibetan asylee, I sat down with him to share more details about the grant. I shared ins and outs of this grant with the hope that he clearly understands the objectives and requirements. For an hour’s meeting, I asked several times for questions and additional clarifications. At the end of meeting, I gave him a time to think about the grant (including consultation with family members) and if interested, contact me again for appointment. As this is a matched grant, a new client needs to open a smart savings account with the partnering bank, Capital One Bank at Jackson Heights. It’s a special account with no minimum balance requirement as well as no service fees or fines. As of writing this piece, he did not contact for a follow-up appointment. However, the problem is what I heard from someone who he knew and I happen to have conversation with. There were questions asked about the grant that should have been asked when I met him earlier. Most disturbingly, one question was pointed towards my integrity with a baseless accusation – that I receive commission from the Capital One Bank for opening a new bank account at its Jackson Heights branch. I could explain in details about why I don't get commission from the Capital One Bank but the crux of matter here is about making wrong assumptions and thus, spreading rumors. The second incident was experienced after five or six months into my job. It’s was a phone call from someone I believe was using a fake name. He was looking for a commission for every client he refers to the federal grant. During the conversation, I wished to slap him but I can’t. I humbly declined with a note that this grant has no problem with enrollment. The only reason I post flyers on social medias and local business centers in Jackson Heights is to attract more Himalayan and Tibetan people for the grant. It was more of an information sharing. The final incident relates to the notion of Tibetan and Himalayan people that the enrollment in this federal grant will impact benefit programs such as food stamps, Medicaid, and citizenship. Despite my sincere efforts to clear these rumor-based facts through writing and counseling, it still persists. When I explain, many Tibetans believe I am saying these truth (they see it as lies) for the sole reason of convincing them to enroll in the grant. With these prevailing negative attitudes, it becomes frustrating as well as difficult for a Tibetan professional to sincerely work for its own group of peoples. I sometimes wonder if I am not a Tibetan but a white Caucasian, do Tibetan and Himalayan people will have the same negative attitudes towards him/her? I am interested in knowing more about your thoughts and experiences. Please share and discuss freely. I understand your frustration. It really is so annoying. I guess our people are just crazy about the dollars. They don't have the feeling of community development. Sad but true. Sad but true.. Especially the second generation of Tibetans from India and Nepal have sadly grown up as refugee without ones own country, so they lack the perception of seeing someone from your own community successful. They tend to perceive every Tibetan as one of their own, and since they thrive on these petty thoughts of easy-money making schemes, they think the same for everyone. Very judgmental, but sadly true.